How many hours a week should science trainees (postdocs and graduate students) work per week? I raised this question in a poll recently (you can still vote here) and a big turnout. The results are above. Nobody thought trainees should work less than 40 hours a week. Only 11% felt that trainees should work a “standard” 40 hour work week. The same number felt that trainees should work >60 hours a week. Overall, about 89% felt that trainees should work 50 hours or more. Of that group as a whole, the most votes went to the option of 50 hours a week, followed not that far behind by 60 hours a week. 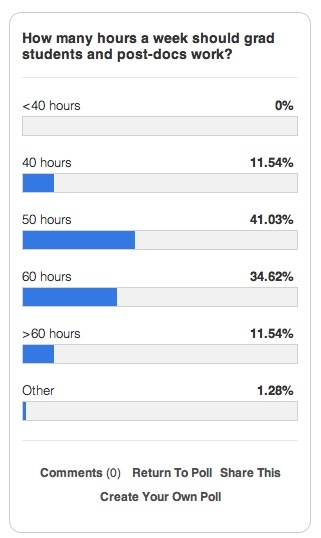 I think that the respondents to this poll have it about right, although from my experience 60 hours a week is more likely to lead to success. However, in this time of postdoc unions and other changes, the trend may be shifting significantly to fewer hours. Of course the quality of the work is more important than the quantity. The most successful scientists reach high levels of quantity and quality of work…and their own excitement drives them.